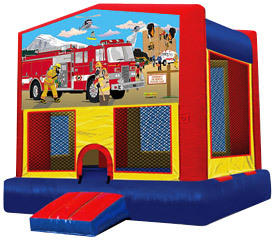 Bring the action to your party with our Firemen on a Mission (firetruck) bounce house. It is the perfect choice for your Firemen (Fire Engine - Firetruck) Theme Party. We from BounceHousesForRent.com will provide you with this new and clean Firemen and Firetruck Theme Jumper. Our price includes delivery, setup, and pickup within our delivery area. We serve parts of Los Angeles County and Orange County, California. We rented a jumper and a snow cone machine and they were both AWESOME!!! Very clean and service was great! This is the 3rd or 4th time we have used GOJUMPER and will use again. We were so pleased with your service. The bouncer was great, and both the drop off and pick up crews were friendly and timely. Thanks so much! We rented the fireman jumper for my son's 3rd birthday and it was a huge it! It was the cleanest jumper I have ever seen. The drop off and pick up were timely and the team was very polite. I will definitely use them again! The jumper was a great time for the kids (and adults too). The delivery & pickup were seamless. The guys were real friendly & professional. The jumper was a little dirty on the inside with sand and all, but nothing crazy. Would definitely recommend company to anyone. Good price for a good product.